I have used one of the delightful * curly trees* that come in a pack of two along with the *hearts background mask* . I spread *crackle paste* through areas of the mask onto the blank canvas. When it was dry I added some *DecoArt paint (Cobalt Teal Hue, Primary Magenta & Hansa Yellow Light)* using a sponge. 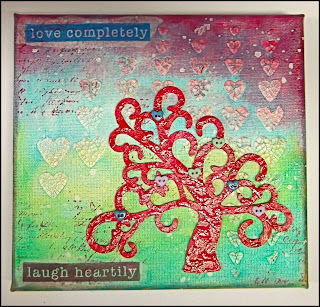 The tree was coloured with the Primary Magenta and then coated with *crackle glaze*. I added some teensy heart buttons from my stash. The sentiments have been stamped onto tissue paper and attached with *matt medium*.